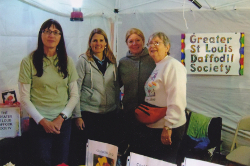 Lynn, Suzanne, Debra, and Vaughn are ready for customers at the Greentree Festival in Kirkwood. 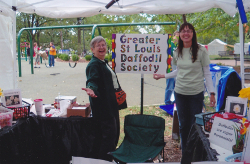 Lynn and Vaughn with Daffodil Bulb Sale sign at the Greentree Festival in Kirkwood. 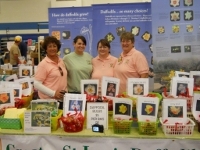 Sonja, Katrina, Brenda and Cindy at Brush & Palette Club Arts & Craft Festival in Hermann. 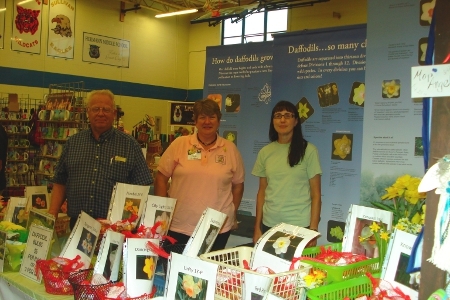 Gary, Cindy and Lynn at Brush & Palette Club Arts & Craft Festival in Hermann.